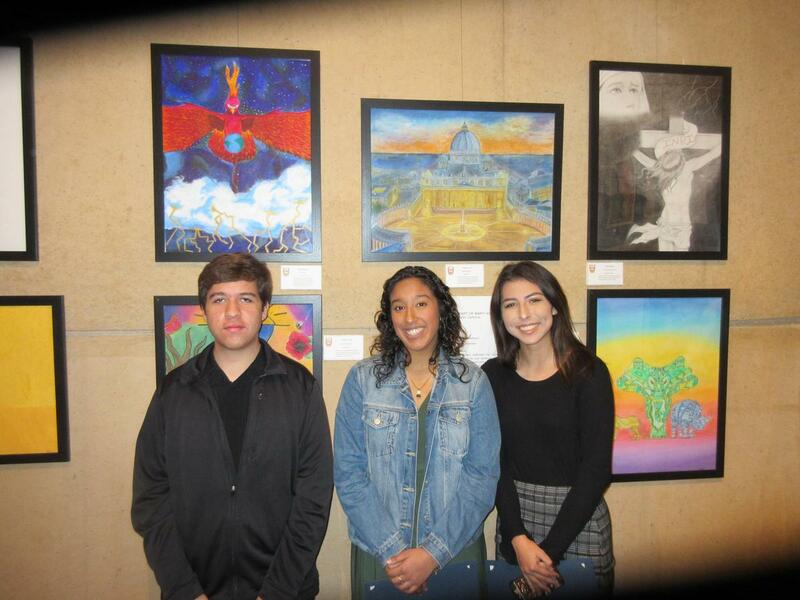 CSHM Students exhibit artwork at Our Lady of the Angels Cathedral! The annual art show at the Cathedral was again a hit for all involved. Every year fifteen 15 Archdiocesan high schools contribute 5 pieces of art to create a great show of high school talent. Pastor David Gallardo presided over a special Mass honoring the arts in the Catholic Church. In his homily he explained how the creativity of these student artists is part of the elevation of their total spirituality. Father Gallardo, whose history includes classroom teaching, explained the importance of promoting the arts as a necessary part of the high school curriculum. CSHM has participated in this show 6 out of 7 years and once again your Cardinals can be very proud of their hard work! The theme of this year's show is the individuals interpretation of their spirituality. Our CSHM students spent hours creating beautiful pieces of art. Please take the time to visit the Cathedral during the Easter Season and feel the spiritual creativity of the students from Cantwell Sacred Heart of Mary. The exhibit will be displayed until April 21.